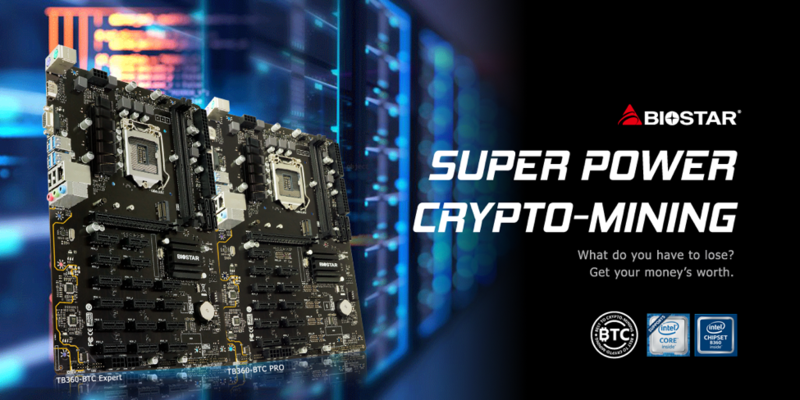 September 18th, 2018, Taipei, Taiwan – BIOSTAR, a leader in crypto mining motherboards, introduces two new BTC series professional crypto mining motherboards - TB360-BTC Expert and TB360-BTC PRO. Fully optimized for professional crypto mining, the TB360-BTC Expert and TB360-BTC PRO support 17 x PCI-E 3.0 and 12 x PCI-E 3.0 expansion slots respectively. Packed with features for scaling up professional mining operations of any size, the TB360-BTC Expert and TB360-BTC PRO ensure a rock-solid mining system with improved mining performance. 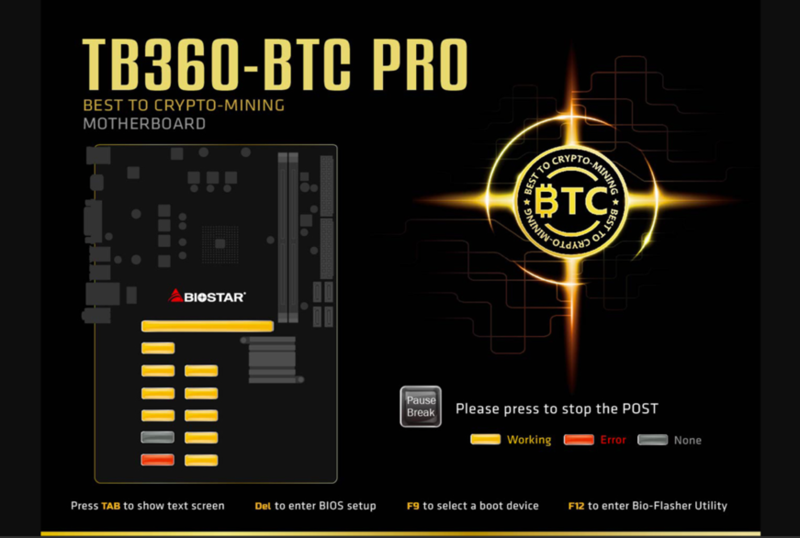 The BIOSTAR TB360-BTC series is also the first crypto mining motherboards based on the B360 and H370 chipset, which can support 8th generation Intel Core processors. The BIOSTAR TB360-BTC Expert allows professional miners to build the ultimate mining rig. It features the Intel H370 chipset that supports the 8th generation Intel Core processors. 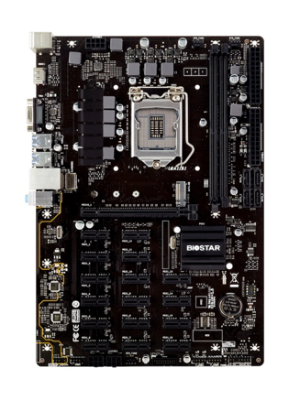 The BIOSTAR TB360-BTC Expert includes 17 x PCI-Express 3.0 slots (16xPCI-E x1 slot and 1xPCI-E x16 slot) to run up to 17 Nvidia and/or AMD graphics cards at the same time, with two 24-pin power supply connectors. It has a single M.2 M-Key 6Gbps connector and 4 x SATA III ports for quick information transfer. The motherboard is built to run in the toughest conditions as it features BIOSTAR’s Protection+ premium features including Super LAN Surge Protection and Super Anti-Surge Protection. KVM support is also available with HDMI and D-SUB connectors to scale up. 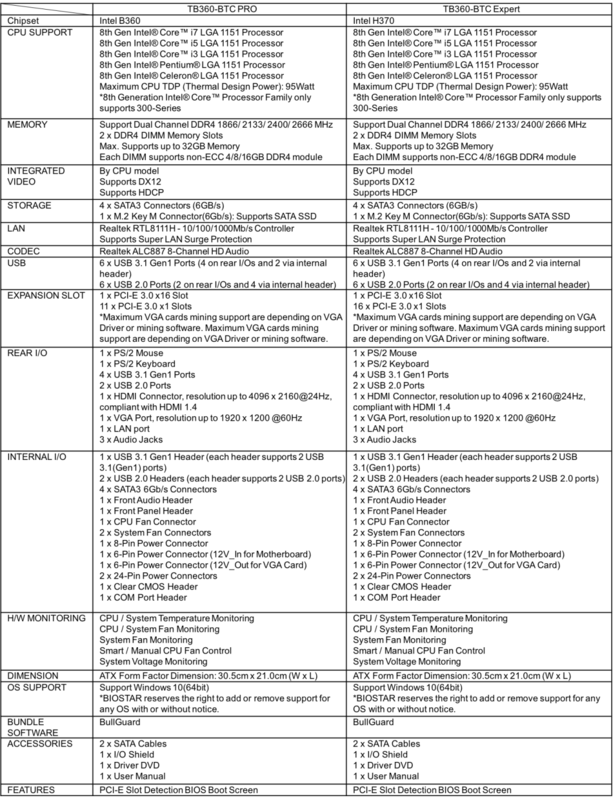 The TB360-BTC Expert rear I/O includes 1 x PS/2 mouse, 1 x PS/2 keyboard, 4 x USB 3.1 Gen1 ports, 2 x USB 2.0 Ports, 1 x HDMI connector (up to [email protected] resolution), 1 x VGA port (up to [email protected] resolution), 1 x GbE LAN port and 3 x audio jacks. 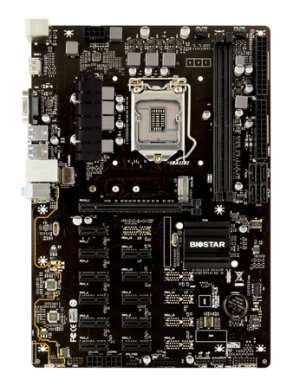 The BIOSTAR TB360-BTC PRO is the first ever Intel B360 chipset motherboard that supports up to 12 graphics cards. To sufficiently handle such power requirements, the BIOSTAR TB360-BTC PRO can run dual power supplies, thanks to the two 24-pin power supply connectors without the need for jumpers. It has a single M.2 M-Key 6Gbps connector and 4 x SATA III ports for quick information transfer. 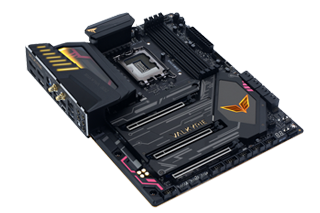 The motherboard is built to run in the toughest conditions as it features BIOSTAR’s Protection+ premium features including Super LAN Surge Protection and Super Anti-Surge Protection. KVM support is also available with HDMI and D-SUB connectors to scale up. The TB360-BTC PRO rear I/O includes 1 x PS/2 mouse, 1 x PS/2 keyboard, 4 x USB 3.1 Gen1 ports, 2 x USB 2.0 ports, 1 x HDMI connector (up to [email protected] resolution), 1 x VGA port (Up to [email protected] resolution), 1 x GbE LAN port and 3 x audio jacks. With up to 17 native PCI-E slots, the TB360-BTC Expert and TB360-BTC PRO reach higher hash rates compared to motherboards with fewer PCI-E slots. The native PCI-E slots provides dedicated channels for each slot which makes mining more efficient, unlike previous H110 chipsets that requires PCI-E x1 extension chips. The TB360-BTC Expert and TB360-BTC PRO motherboards reduce the cost of hardware investment when compared to 6 x PCI-E Slot motherboards. Instead of building up to 3 systems, miners only need to build 1 system, which means fewer components are needed in CPU, motherboard, SSD, DRAM and peripherals. The TB360-BTC PRO and TB360-BTC Expert can be setup effortlessly through the dedicated Mining Mode BIOS which is enabled by default. Without the hassle of making any BIOS changes, this easy-to-use and easy-to–setup feature enables any first time miners to get started right away. For ease of management and de-bugging, miners can check the status of each graphics cards prior to the system entering the OS to reduce down time. This built-in software helps detect GPU state on POST screen, so problems can be fixed as early as possible. Error means that the data is incomplete. None means that no signal for GPU. 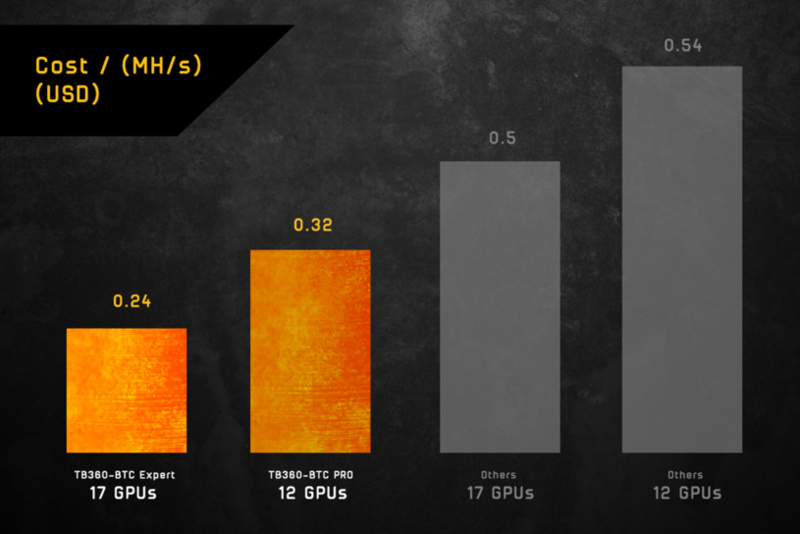 Professional miners are no longer restricted by AMD or Nvidia graphics card supply shortage. 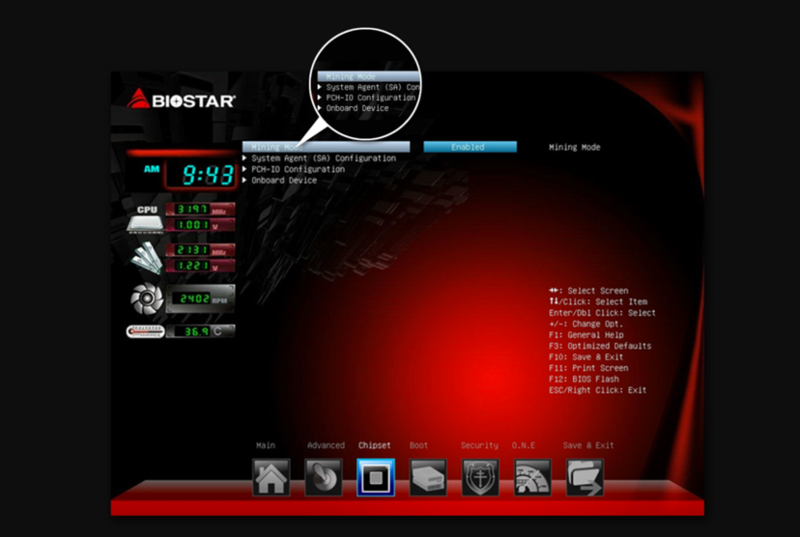 BIOSTAR TB360-BTC Expert and TB360-BTC PRO support a hybrid mix of graphics cards for great flexibility. For example, the setup can be half AMD and half Nvidia graphics on the mining rig. 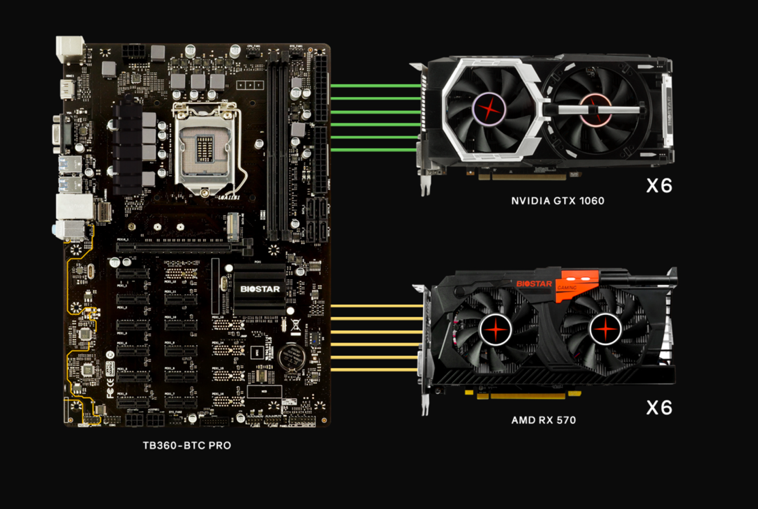 The TB360-BTC Expert and TB360-BTC PRO are both designed from the ground up such as up to 17 native PCI-E slots, dual 24-pin power connectors, M.2 M-Key 6Gbps connector and 4 x SATA III ports for optimized mining performance to enable professional miners to scale up to larger operations. Software included also makes setting up and management of the hardware easier than ever. The TB360-BTC Expert and TB360-BTC PRO are the ultimate professional mining motherboards for today’s mining needs.